SCREW: EN-41. B Nitrated steel scroll having hardness approx. 58-59 RC. Upgraded lead design for maximum, constant output with minimum energy consumption. 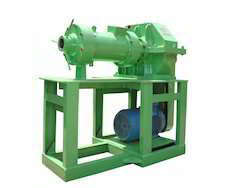 AMCL’s range of Hot feed Extruders are evolved as a result of latest technology in collaboration with KOBE Machinery Co. Ltd. Japan and thorough insight of the Indian Tyre Industry’s requirements. Functionally featured and designed with robust manufacturing, the extruders perform in the most exacting conditions maximizing productivity. 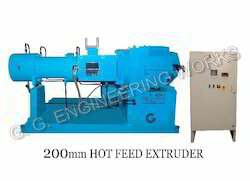 We are a unique name in the industry to provide our prestigious clients an exclusive range of Hot Feed Rubber Extruder Machine. "Bharat Hot Feed Extrudes are ideally suited for production of Rubber Chords, Rubber Strips, Rubber Profiles, Rubber Tubing, Rubber Channels, Rubber Treads and are Specially designed for meeting the need for efficient and quality extrusions.